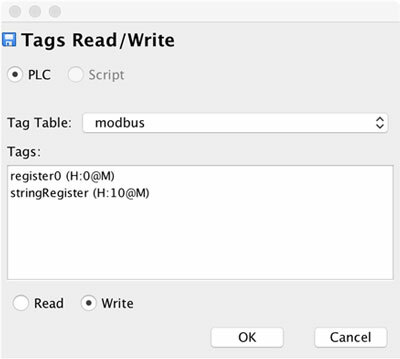 To write values into the PLC, you will follow the exact same procedure as for reading tags, but, in the end, you will use a different function to write values. In this example we will write a numeric value and string into the PLC. 1. We will prepare PLC Variables Table named “modbus”, to do so, please follow steps 1. to 6. In the previous section. 2. Once you have the R/W Dialog loaded, please tick the Write on the bottom part of the dialog. When you are done, press the “OK” button, and myDESIGNER will generate the code for you. 3. When this code runs, values 10 and “String” will be written to the PLC.